Most likely, if anyone said something abusive to Phillips, it would have happened in the bottom of the eighth inning, when Jared Hughes plunked him with a pitch and Phillips flipped the ball back toward Hughes, which caused Hughes to mouth a few f-bombs back at Phillips, as you can see in the video below. When the next batter came to the plate, Phillips stood on first, staring at Hughes without taking a lead. Hughes made a pickoff attempt anyway. There were points to prove, see. 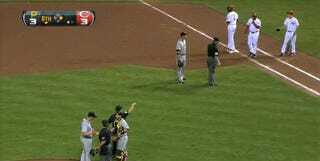 And after the inning, Phillips could be seen exchanging words with Andrew McCutchen before then stating some sort of case to one of the umpires. Nobody else has mentioned hearing any sort of slur yet. But maybe whatever Phillips heard was muttered for his ears only, perhaps in passing. Or maybe Phillips is just trolling everybody. I'm sure he'll be asked to explain it all later today. SEE ALSO: Source: Brandon Phillips Thought Jared Hughes Called Him "Boy"